Can Stress Really Make You Fat? Stress is naturally a big influence on your fitness. In some ways, it can build you up like when you work a muscle to make it stronger. In other ways, it can break you down, like when you don’t get enough sleep. 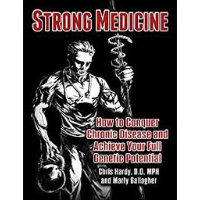 The book, Strong Medicine, does a fantastic job of describing the role stress plays in your health and fitness plus practical ways to use it to your advantage. Stress can certainly hurt or heal depending on how you relate to it, but can it make you fat? The short answer is no, stress can’t directly cause you to get fatter. Otherwise nearly everyone who isn’t constantly on cloud nine would be terribly overweight. However, stress can be a big influence on weight gain and it’s this potential influence that should be addressed. A lot of the talk about stress and weight gain centers around the hormone cortisol. While it is true that cortisol can play an influential role in fat storage, there’s a lot more to the story. Diet, other hormones and a host of other factors also play an influential role in how cortisol affects your waistline so it’s not as simple as stress=cortisol=weight gain. But stress can play a big role in your weight because it plays an important role in regulating your energy level. Your energy level is by far one of the biggest influences on your weight, muscle mass and health. Everything you want, from strength and muscle to a lean set of abs is easier to achieve when you feel both physically and mentally alive. The opposite is the case where a low energy level can make any positive change very difficult. Ironically, many of our common fitness habits are geared toward piling even more stress onto you. Punishing workouts and restrictive diets only add to the stress you’re already dealing with from daily life. This is why some fitness methods can actually hold you back by piling on more stress that further drains your energy level thus making it more difficult to achieve your goals. This is why I recommend using exercise and training as a tool to stimulate the changes you want instead of a way to create fatigue and more stress. Besides, going into a workout with the intent to basically make yourself feeling tired and worn out can be terribly demotivating. It’s much easier to start warming up and to look forward to feeling good and energized. When it comes to diet I highly recommend avoiding overly restrictive dietary practices that leave you feeling hungry and produce food cravings. The true purpose of a healthy diet is to remove stress from your life rather than cause it. Aiming to satisfy your four primal appetites is a sure-fire way to reduce stress and elevate your energy level. I’m a firm believer in practicing a daily de-stress routine. This can involve anything from taking a casual walk to meditating or just having coffee with a friend. Whatever you like to do, aim to remove yourself from the constant bombardment of screens, information and the need to work on problems. Don’t give into the idea that you can only de-stress once you take care of every little thing. Life has a way of always putting more stuff for you to deal with on your desk so it pays to take a proactive approach to stress reduction. Hollywood has discovered Clenbuterol, declared it the new weight-loss wonder drug and started the latest craze in slimming pills. Stress isn’t a bad thing, but it can be used in unhealthy way. Check out this week’s podcast to learn more about how to use stress to prevent weight gain while also handling the stresses of life in a healthy way.